Affordable Breakfast And Great For The Kids! Having seen Eatalio on my travels into town it was a place that had been on my radar for a while, but hadn’t actually found the time to venture in. So, when asked if I’d like to go with the family and review their breakfasts I jumped at the chance! Situated at the bottom of Queens road near Boots and the Clock Tower, it is in prime location for shoppers who need a quick pit stop or for catching the trade of tourists and commuters alike heading to and fro from the train station. The outside is modern with large picture windows that invite you in and once inside the venue does not disappoint. 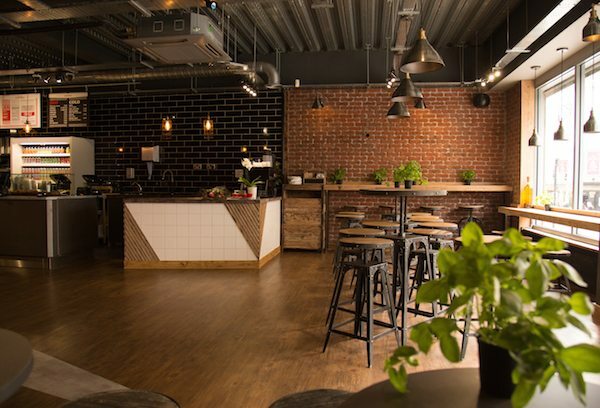 It has an industrial feel with an open ceiling and steel lighting. The seating is modern yet comfortable with a mixture of high stools at poser tables, traditional seating in the middle and then bench style sofas against the wall with tables. Pots of basil are used as table decorations which I thought was a lovely touch. The walls had been papered with old Italian newspapers and then some areas spray painted in warm orange and yellows hues of various designs. With gentle background music playing the place had a lovely warm atmosphere and felt quite cosy – given that the outside temperature was about -1 on the particular morning we visited!! We arrived at Eatalio at 8.30am on a Saturday morning a long time before any shoppers descend on the town. The place was quiet with just two tables in before us. We were warmly greeted by the team and had the menu explained. The menu itself is well displayed above the counter and easy to read. 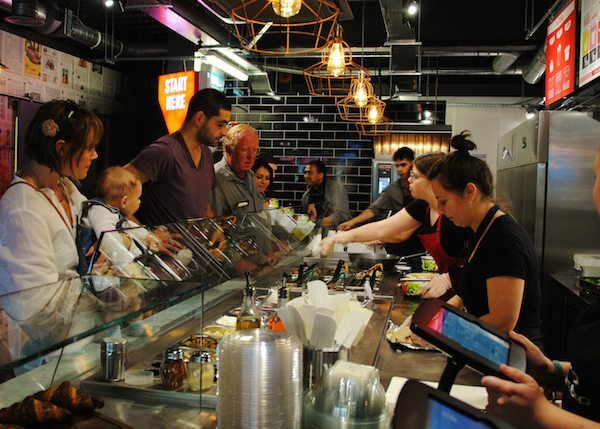 The food counter and preparation area is open for the customers to see and everything was well presented and looked very appetising. We placed our order and chose a quiet corner table where we could watch the counter but also enjoy the view from the large windows onto Queens road whilst we waited for our order. Our drinks arrived promptly – a hot chocolate for me (what else! ), a pot of tea for my partner which was presented beautifully on a wooden board, and then two fruit juices for the kids. The juices were lovely and thick and took me back to the kind of juices that I’ve had whilst on holiday in Italy, not the usual juices that are commonly served here in other eateries. 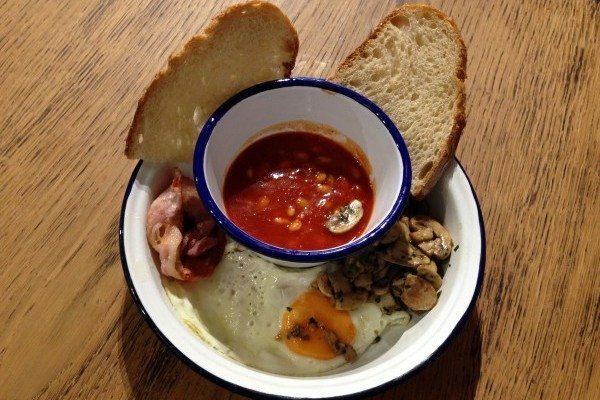 My partner opted for the ‘Breakfast Pot’ (£3.75) – a tin bowl with crusty bread, mushrooms, fried egg and saucy beans served in a separate pot. It was beautifully presented and very tasty by all accounts. The mushrooms were cooked well and had been seasoned with herbs which made them delicious. The beans were very yummy with a very herby tomato sauce and the egg was cooked well with the yolk still runny. 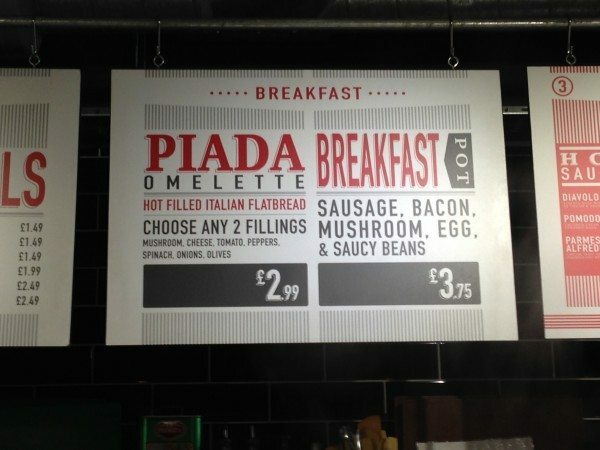 I chose the ‘Piada Omlette’ (£2.99) – which is a hot filled Italian flatbread. There is a choice of fillings and I opted for the spinach and mozzarella cheese. When it arrived it had been cut into thirds and served on a black plate, a first glance I have to say it didn’t look particularly appetising or big, however the combination of the egg, spinach and slightly salty cheese was very tasty and surprisingly filling. The flour tortilla encasing the omelette added a nice crunch to the dish, I just felt that it needed something else on the plate to make it look a little more inviting. For the boys I chose a sausage roll each (£1.49). This consisted of 2-3 sausages served with ketchup in a mini focaccia bun. The boys hoovered them up and they thought the rolls were superb! The small bit of bun that I did get to try was delicious and soft. It was a perfect size for the boys and they ate the whole roll. 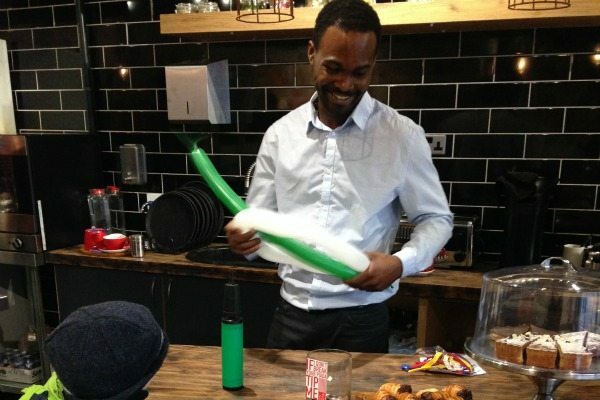 Once we’d finished eating the manager then showed the kids some impressive balloon modelling skills with a kit that he produced from under the counter! A dog for one and a sword for another!! Who knew! Price wise, Eatalio can do no wrong. The Breakfast pot at £3.75 was the most expensive breakfast option on the menu and I’m not sure of many other places that can offer a sausage, egg or bacon roll for £1.49 – especially when served in such a delicious Italian focaccia roll. The place was not busy at the early hour when we arrived and at about 10.00am – a few more tables had arrived and town was starting to fill so I’m sure it was only going to get a lot busier throughout the day. 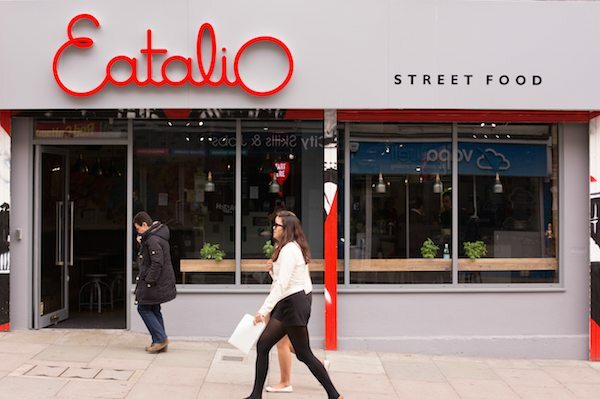 To summarise, we think Eatalio is great concept, the food is delicious and I hope that with such value for money it’s going to be here for a long while to come. 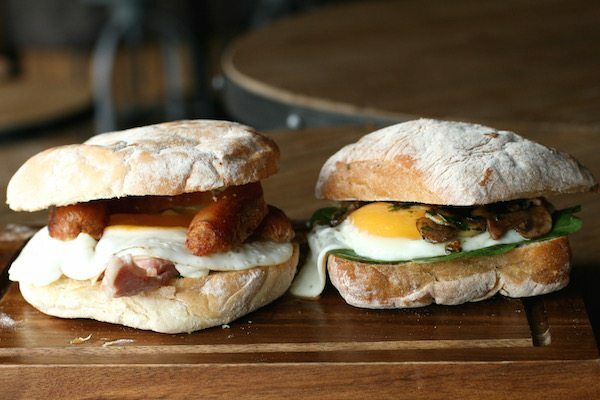 A great and new breakfast alternative for Brighton..
I’ll definitely be visiting again to see. 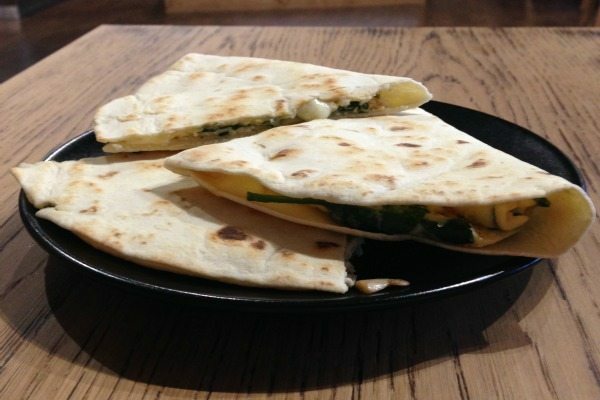 Video – What is Piada?